Resistance bands are one of the oldest exercising tools used in both fitness and rehab that recently have also been gaining more and more popularity. Similarly to their free weight counterparts (i.e. Dumbbells & Barbells) resistance bands provide some degree of resistance, they allow for free range of motion, and variable movement speed. Also like free weights, they provide progressive resistance (meaning resistance can be added). Unlike free weights, resistance bands do not rely on gravity to provide resistance, they provide continuous tension, and it also become more difficult to cheat the exercises with resistance bands as momentum can to always be used to your advantage. Another great benefit to using resistance bands is that they provide linear variable resistance meaning that as the range of motion on the bands increases, so does the level of resistance. Can be combined with other equipment during the workout (i.e. Dumbbells and barbells for added resistance. My favorite resistance bands on the market right now are the ones sold by bforebands because their bands are incredibly variable. you can interchange the bands to be attached to any anchors, the doors, ankle wraps, and regular handles. They also have lateral bands which are great for resistance leg and glute exercises! to get 10% off all your bforcebands orders you my bforcebands coupon code “LETLERFIT” at checkout! Sore muscles. At one point in everyone’s life, I am pretty sure we have experiences the pain and discomfort of sore muscles from physical activity. What some people may not have experienced is that bittersweet feeling of foam rolling. What exactly is foam rolling and why is it beneficial for our recovery? Foam rollers are primarily used for SMR (self-myofascial release). SMR put simply is when we apply a dragging pressure on out muscle tissue in order to have our body to release muscle tension and increase mobility between the sliding surfaces of our muscles. SMR is a major contributor to increased blood circulation and increased mobility range of motion in our recovering muscles. All of which allows our recovery time to decrease and make room for more effective training sessions. When should we foam roll? Personally, I love to roll out before and after my workout. Before my workout as a prelude to my dynamic warm up to stretch out my muscle tissues which allows them to be less tight, decreasing my probability of pulling or straining my muscles. Post-workout it is a great way to decrease any lactic acid build up, which also allows you to recover quicker and be less sore after a training session. Choosing your foam roller: There are a million and one different foam rollers on the market and I have probably invested hundreds of dollars into the different kinds in hopes of finding one that works and feels the best. From flat to pointy surfaces you name it and I have tried it. It wasn’t until I gave The knot out a try (They did not pay me to advertise for them and I get no financial benefits from promoting them in this post). The reason why I fell in love with the Knot out is because their rollers are not flat, they are “squiggly” for lack of a better term, which is perfect because my muscles are not flat. So having different approaches to angles and pressure points during my roll out sessions allows me to reach larger areas and go more in depth into the muscle tissue. They also have two different densities, soft and firm. That again, creates diversity while rolling out your muscles. What’s great about them is that they also have an entire section on their website dedicated to educating people on how to PROPERLY foam roll and the different ways to foam roll. Anyways, today’s post is dedicated to reading nutrition labels (the basics). By law every food item we purchase at a convenient store, supermarket etc. that comes packaged must contain Nutrition Facts that include ingredients, macronutrient and micronutrient break downs, serving size, and calories per serving. 12 g of fat, 31g of carbs, and 5g of protein. So per serving 12g of fat times 9 gives 108 calories from fat, 31g of carbs times 4 gives 125 calories from carbs, and 5g of protein times 4 gives 20 calories from protein per serving. In total that is 253 (rounds down to 250) calories per 1 cup of this food item. Underneath the macronutrients, the micronutrients are listed. Next to both macro and micronutrients you can find the % Daily value column. The downfall to this column is that the daily values are based on a 2,000 calorie diet (average male diet) so women have to estimate based off of the listed daily values. So for example, if you are eating this food item and consume roughly 2,000 calories a day you are getting 20% of your Calcium needs, which means in your other foods you need to consume the other 80% of your Calcium needs. 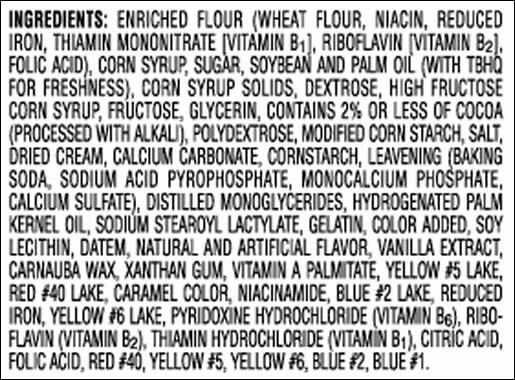 In the attached photo ingredients are not listed, but on all labels you can find them. So looking at a label you see from very few ingredients to labels that contain tons of weird ingredients. The less ingredients, generally the better the food item is for you. The more ingredients on a label, the more fillers, useless junk, chemicals, and preservatives are what can be found. The order in which the ingredients are listed are NOT random by the way. The ingredients that comes first on the list are the ones that are most found in the food item while the ingredients towards the end of the list are the ones that the item least contains. In the above example, the item most contains enriched flour and has the least of the food dyes. Last week was nuts to say the least! Tuesday I spent from 10am-6am studying for my Chemistry exam. Took a 30 minute cat nap and left to Day of 1 of my Kettlebell Concepts Level 1 Certification workshop. Amidst Day 1, I left back to school to take the Exam and then rushed right back to finish Day 1 of the course. For those of you who are new to my blog, I am very much into Crossfit. In crossfit, we are constantly using the Kettlebell in our WODs. So for me, the biggest take home from this course was not a movement, but being able to perform every movement and be consciously aware of how the way it was carried out is affecting my form and efficiency. I am happy to announce that I did pass the practical and am one online exam away from officially being Kettlebell Level 1 Certified. So that was part of the pre-conference to the WSSC (World Spinning and Sports Conference). Moving onto Friday battered and bruised from all of my Kettlebell mistakes I took 4 workshops/lectures. My day started with a 9am introduction to ViPR. The only way to describe the ViPR is its close resemblance to the strong man log, only not as heavy and not meant for single direction lifts. It is incredibly dynamic, which makes it great for all ages. Definitely plan on investing in my own ViPR to add to my current regime. Then at 11am I attended a Lecture on the Paleolithic/load carb dieting. Though I am not a fan of the low carb lifestyle simply because of how important the right kind of carbs are for our bodily functions (Refer to macro post). I did however, learn the reasoning behind it and got more educated on why it is beneficial to people who are obese. At 2pm I took a workshop entitles Shock Wave. Basically one full our of interval sprints on the spin bike. Mind you haven’t done a spin class in YEARS so imagine how I felt after one hour of interval spinning. It was death and I’m still feeling it. To end the first day of the conference I attended a 4pm on the Adrenal Fatigue myth. In summary, the lecturer basically said that people think its from exercise, but in reality more than it is from over training it is from lack of sleep and overall exhaustion. Saturday morning I missed my 9am workshop due to a fluke bug that hit me like a truck friday night, so I slept in. I ended up starting the day at the 11am with a workshop entitled “Advanced kettlebell lifting for Metabolic and Neurological Adaptations.” After that workshop, I am even more excited to pursue my level 2 cert as well as incorporate the circuits we learned as a part of my warm ups. 2pm was the booty belly bootcamp. When I arrived to the room and saw a plastic board with resistance bands tied around I was intrigued to say the least. Fast forward through the whole workout and I was DRENCHED! I thought some of my WODs were tough, but I got my booty handed to me by the “Club e-fit.” 4pm was a lecture on busting through training plateaus where we went more in depth into periodization programming. Sunday was the final day of the conference and my day started with a 9am mobility is freedom workshop. I left feeling like a brand new person. 4 days of beating my muscles up, I can’t think of a better way to have ended the conference. Overall, I loved everything I did and learned at the WSSC and will definitely be back next year! On thursday, my posts will be back to normal and I will be blogging about Dark Chocolate as requested by a client/friend of mine. Here I am finally able to sit down and write my weekly post after surviving week 1 of 6 of summer semester general chemistry 2. Anyways, today I wanted to touch up on High Intensity Interval Training otherwise known as HIIT. Fingers crossed, my ebook will finally be out by the end of June. I have put crazy amount of time, effort, and research into constructing my 30 day program. After much hair pulling, I decided that my first ebook would be centered around HIIT. Why? there are 3 main reasons. 1. It is for all fitness levels. Because there are small bouts of exercise before an even smaller rest, a person of any level is able to push themselves as hard as they possibly can in that bout of exercise. Of course, it’s not really advised to sell yourself short and not give it your all in order to get the maximum benefits. 2. Fat burning and metabolic boosting benefits Not only do you burn twice the calories in the same amount of time as you would doing more traditional forms of cardio (treadmill and elliptical), but HIIT generates whats called EPOC (exercise post-exercise oxygen consumption). EPOC in simple turns is when your body continues to consume oxygen even after your workout and sets your body up for more calories burned throughout the day. So imagine starting your day with just 30 minutes of my HIIT program! 3. Strengthens the heart. A stronger heart muscle allows us to carry out daily activities like walking and using the stairs with more ease. A stronger heart also allows your body to pump blood more efficiently and ultimately reducing your risk of stroke, high blood pressure, diabetes, high cholesterol with more production of the good cholesterol, and heart disease later on in life. Stay in the loop of my upcoming ebook publication date by liking my Facebook page and following my company instagram! I mega-apologize for being MIA this past week and a half. I can officially say I am done with Spring semester and am FINALLY graduating with my degree in International Relations and Political Science with a minor in Business. I am now able to focus 100% on my Nutrition and Dietetics BS. Because sugar is a carb, it does provide our body with energy. What happens when we don’t have enough time or activities in the day to burn off the carbs by using up the energy? It turns into fat. This is why people who are trying to lose weight or maintain a lean build are recommended to avoid eating anything with sugars in the evening. Unless of course you’re more intense workouts happen at night. For most people however this is not the case. When sugars go unused throughout the day your body converts it into stored fat in a process known as lipogenesis. (lipo=fat genesis=origin or formation of something). If you do choose to eat sugars late at night, ditch the processed sugars (candy bars, juices, granola bars etc.) and go for the real sugars found in fruits (well, you should always go for natural sugars if you have to ear it). Personally, I prefer berries because they are lower on the Glycemic Index. I know this post was very short, but I hope this helps clear up any confusion you ever had on why you should avoid sugars later in the day. Why is proper hydration important? Far too often have I asked clients what their total water intake is, and the answer is always too little. Sometimes I have even gotten that people are AFRAID to drink water because they are afraid they will gain the water weight. Excess water weight usually happens with too much salt in your diet because salt makes you swell up and retain fluid but it does not mean that you should stop drinking water in order to keep the number on the scale from going up. How much water in a day should somebody aim for? Water accounts for about 50-60% of our total body weight. Personally, I usually go off of multiplying your body weight by .5 if you’re sedentary, by .6 if you’re lightly active, and by .7-.8 if you are very active to ensure you are putting back the liquids your body sweats off. You can always check with you doctor to see if you’re drinking the right amount of water. 1. Regulate body fluids. Your body needs water to aid in digestion, nutrient transport and absorption, as well as body temperature regulation. 2. Appetite Control: despite what many people think about water making you gain weight it actually helps you control and even lose weight. Why? Imagine how many calories you would save if you’re day didn’t consist of 8 glasses of juices and sodas, but only of water. You can also find water in the foods you eat. Foods like fruits, veggies and oatmeal look large and are very filling because they contain higher amounts water compared to other foods. Bigger, healthier foods with less calories and more water still fills you up because they take up the same amount of room in your stomach as lets say a doughnut and a creamy latte. 3. Water gives your muscles energy. When the cells that make up your muscles are lacking in fluids and electrolytes they shrivel up, which causes muscle fatigue. The American College of Sports Medicine (ACSM) recommends drinking about 17 oz. of water 2 hours before exercise, at the beginning of the exercise and regularly during your workout to ensure proper hydration and replacement of fluids lost in sweat. 4. Radiant skin. When you’re dehydrated your skin gets very dry and wrinkly. So proper hydration allows for glowing skin and less wrinkles. 5. Mental Focus. Dehydration messes with your memory, motor skills, and attention span. Trust me on this one! A few weeks ago I misjudged my rehab time after dealing with the stomach flu and I went to workout in the sun. Long story short as I’m lying on the floor staring at the medics, it was very difficult to mumble the answers to the questions I was being asked (one word answers mind you). While trying to rehydrate myself, I found myself very unproductive. All I wanted to do was lay in bed and watch TV. For those that know me, that is the complete opposite of who I am. 6. Drinking water aids your kidneys in detoxing your body (peeing). When you’re hydrated, your urine is light and odorless. On the contrary, the darker and smellier your pee is, the more you need water. 7. Prevents headaches. Have you noticed that when you go without water for a long time you get a headache? Well, that’s your body’s way of asking for water. Case studies have found that people who suffer from migraines and drink 2-3 glasses of water within 2 hours of having it, show a decrease in overall tension and pain. 8. Immune health. Regular peeing allows your body to get rid of germs and bacteria that may causes viruses like the common cold. 9. Digestive health. When you deprive your body of water, the kidneys become forced to take liquid from your poop (gross, i know), which makes it harder for your body to excrete your poop. Proper hydration allows for your kidneys to receive the water it needs. It also allows the fiber from your diet to expand inside of your body to help you poop more frequently. You should be using the restroom at least once a day. Anything else, is considered constipation. How much water do I drink? For my weight and activity level I drink a gallon of water a day. How do I make sure I’m drinking enough water? I have found that water bottles just don’t work for me because by the time I drink them, I forget to refill them or I just get caught up with a million and one things. So instead, I carry around a gallon. Yes, It’s annoying but it beats having to waste time refilling water bottles and it allows me to keep track of my daily water consumption. I posted a picture with a coupon code for gallon gear. It has saved my life. Not only does it keep my water gallons cold, but when I go to the gym I leave everything in the trunk of my car because theres a space for my wallet, phone, and keys. It’s genius! I definitely recommend it to athletes or anyone that is serious about their hydration.